The supporting frame is in solid Canaletto walnut. All the flat surfaces are in birch plywood covered in Saddle Extra leather, with the sides finished in Canaletto walnut veneer. The brass parts have been given a protective clear matt surface treatment. 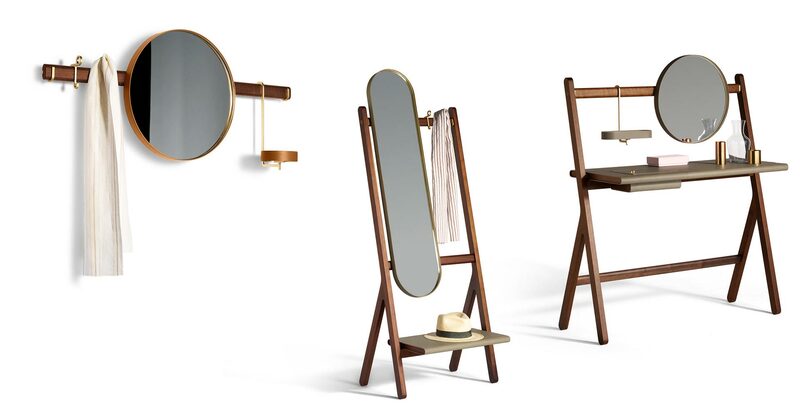 The mirrors are characterised by a brass frame covered in Saddle Extra leather and the back in birch plywood with Canaletto walnut veneer. The free-standing mirror coat rack has a shelf, oval mirror and two coat hooks in brushed steel, with brass-finish galvanic treatment. 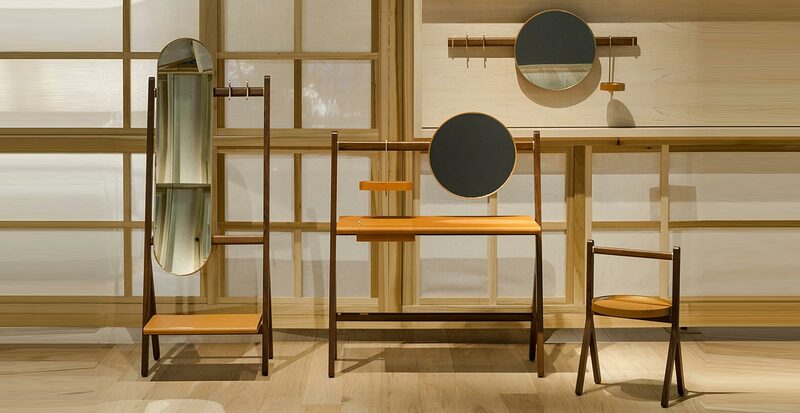 The supporting structure for the wall-mounted mirror clothes rack is in solid Canaletto walnut wood bar on which the various accessories are hung: two brushed steel coat hooks, with brass-finish galvanic treatment, a round mirror and a key tray. The console table has a lift-up top entirely covered in Saddle Extra leather both inside and outside. The round mirror and key tray make this piece of furniture even more functional.